It’s not every day that you walk into a classroom for a midterm and are handed a wok and colourful ingredients. But that’s exactly what happened to students enrolled in Edible History: History of Global Foodways at U of T Scarborough. Instead of sitting down to write an essay, they faced a “pop-up” kitchen where they cooked curry recipes, spanning 400 years into the past. 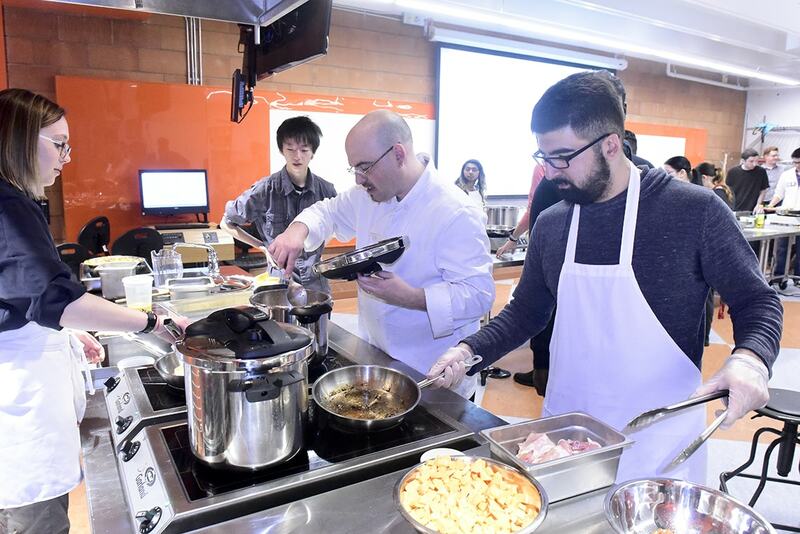 “Curry is one of those remarkable foods that has really travelled the globe,” says History Professor Dan Bender, director of the Culinaria Research Centre and the course instructor. In addition to preparing one of 15 different curry dishes dating all the way back to the 1600s – the earliest being Akbar’s Dopiaza from Mughal India – students were also expected to serve the food and offer a mini lesson to diners. The diners in this case were staff, faculty and students from across campus invited to sample the dishes and hear about what makes them unique. “I can lecture about different cooking techniques and ingredients or get students to read examples of culinary exchanges and encounters. But until they get to experience it firsthand, there’s no substitute for that type of learning experience,” says Bender. A prime example of how curry is such a global dish is the Japanese Battleship Curry from 1877. Around that time the British were consulting with newly industrialized Japan to build a navy and brought with them a taste for curry from India. But in this case, the recipe relied on flour, an ingredient used in many European-style sauces. “The Japanese first encountered curry not in South Asia but in their relationship with the British navy. Even today, Friday night is curry night in the Japanese navy,” adds Bender. Edible History has been offered at U of T Scarborough for more than a decade now but only recently has a minor in food studies been offered. Bender adds it’s the only program of its kind in Canada featuring the only industrial kitchen on a university campus used for teaching purposes. Pirouz Salari, a fourth-year history student, says he enjoys how the course allows him to take theoretical lessons and apply them in tutorials. Much like the pop-up kitchen midterm, the weekly tutorials involve cooking with ingredients they’ve learned about in class. “What I find most interesting about curry is that it incorporates so many different flavours, especially when Indigenous ingredients are added to the mix. There’s nothing restrictive about it,” he says. Salari was responsible for cooking chicken for Akbar’s Dopiaza recipe, which he explains is an Indo-Pakistani curry with some Middle Eastern influences. He said despite being the earliest example of curry on the midterm, it still shows signs of different influences, all traits that epitomize the global dish. “It’s a very unique experience, but more importantly it’s engaging and educational,” says Megann Davidson, a second-year human biology and biochemistry student who took the course as part of her degree requirement. Davidson helped serve A Dainty Shrimp Curry dish that originated in 1890s New York. She says the unique ingredient in the curry is Maggi Sauce, a seasoning that originated in Switzerland, of all places. The idea of a shrimp curry being prepared by Asian immigrants living in New York using an ingredient of Swiss origin highlights the intricate historical and cultural roots of many popular foods.